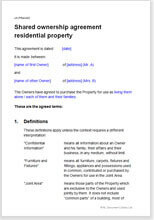 This agreement records in what proportions a house or a flat is jointly owned, how those proportions might change over time, and what happens if one of the owners wishes to sell. It presumes the owners occupy the property at the same time. Under UK law, the registration of ownership does not record the shares in which the property is held. So if you own 60% and I own 40% we have to record that in some other document such as this one. If we do not do so, the law will assume we own it in the same proportions in which we contributed to the purchase price, which may not be the same as we agree. If your solicitor recorded that you are “joint tenants” with your co-owner, you may want to “sever” this arrangement and become “tenants in common”. We explain the difference in greater detail here. In short, the latter is a status that allows you to own an individual share.